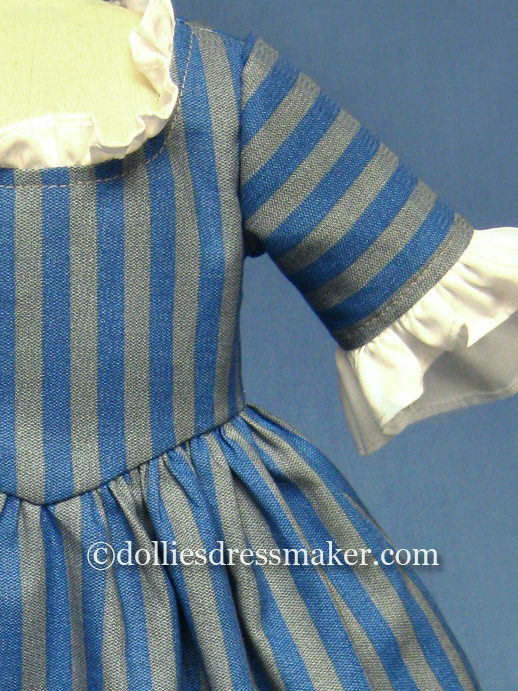 Stripe gown for Felicity inspired by illustration in the book “Changes for Felicity”. Gown from premium cotton fabric. 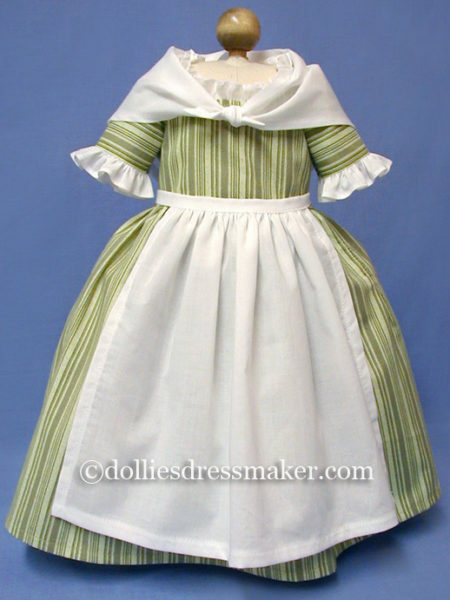 This is the best representation I have ever seen of a dress that Felicity wears in her “Learns a Lesson” and “Changes Book.” She is also seen wearing this dress on the cover of her mystery “Lady Margaret’s Ghost.” This dress is perfect! I am so happy that I purchased it. The material is soft yet crisp (how is that possible? LOL!) and lays so well…the length is just right for Felicity…the bodice fits both my Mattel and PM Felicity dolls…the color is excellent with F’s red hair. 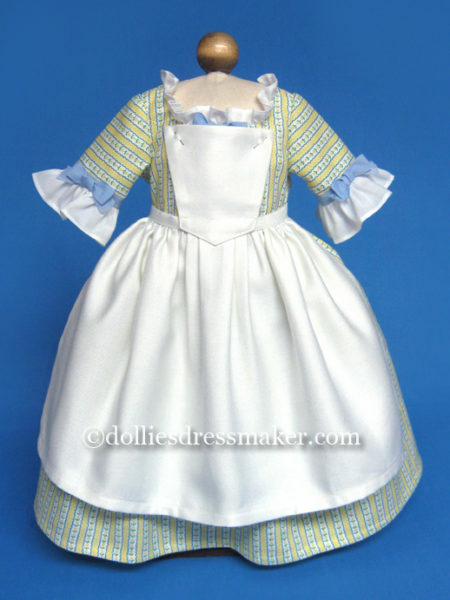 I am limiting my outside AG purchases to clothes/accessories featured in the books, so I am ever so grateful to Dollie’s Dressmaker for this dress. 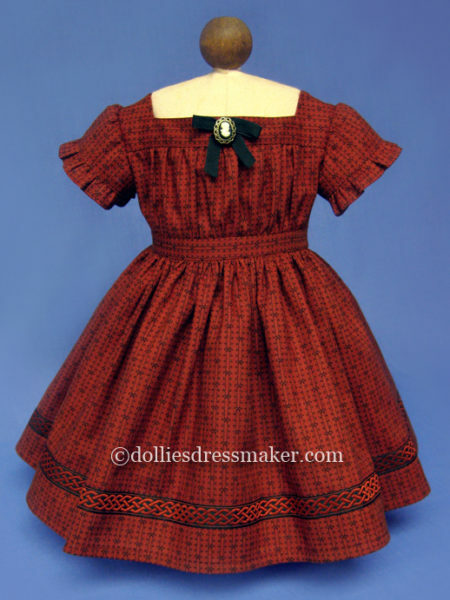 This dress reminds me of the older, Pleasant Company quality outfits for American Girl dolls. I love how it fits Felicity, I love that it is shown in an illustration in her books, and the striped fabric is spot-on. There are always openings in the side seams so Felicity can access her “pocket” properly. I put the dress on Felicity along with her red Cardinal Cloak, a white mob cap, and pattens, and she is adorable! 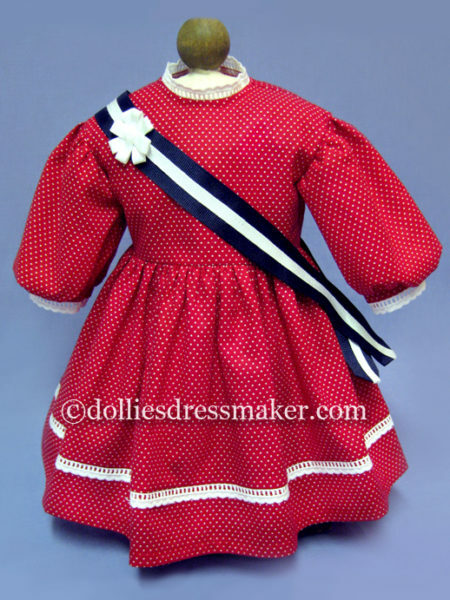 I am always very pleased with the doll clothes I purchase from The Dollies Dressmaker; they are classics. This dress is absolutely gorgeous!!! It is just as good quality as all the actual AG stuff, and is definitely better than quite a lot of it! It fits perfectly on my Mattel Felicity, and is one of my favourite dresses to put on her. I love how it is a dress from the book illustrations, and it is just beautiful workmanship. If you get this, you will NOT be disappointed! I have been buying from her for close to 15 years now, and the quality that brought me to her continues to draw me in. The details in the designs, the fine craftsmanship, and the little things are just so well thought out and executed on these little clothes. I’ve not seen anything like them anywhere for any price. My daughter loved them and now the next generation will have an appreciation for these lovely dresses. My only wish is that there were more items and that things wouldn’t sell out so quickly! I’m stalking the site every week now for new items. I frankly find the quality to be so, so much better than anything AG is putting out, especially these days. This dress is lovely! 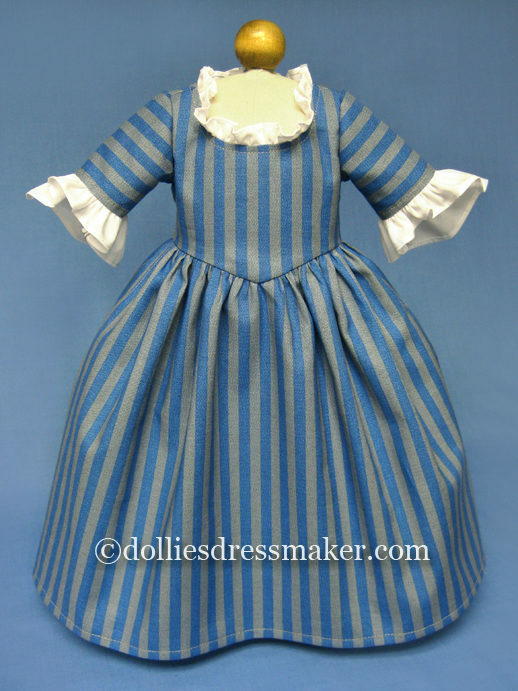 The period appropriate fabric is wonderful and the workmanship is exquisite. I’m so happy I ordered it.